This little penguin is adorable! I like his shiny belly!! very pretty card. This is really cute!! I love the shiny stars! 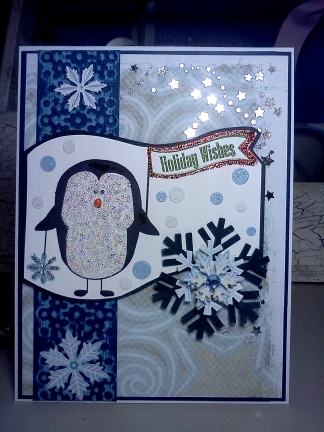 Awww what a sparkly adorable penguin. Thanks for joining us at Tuesday Morning Sketches. Such an adorable card Betty! The penguin is adorable and I love all the sparkles. Thanks for playing along with us this week at Tuesday Morning Sketches. How cute! I love the curvy cut you made for the image bg, and the penguin is adorable. Thanks for joining us at Tuesday Morning Sketches!